Warren Newport Public Library, located in Gurnee, Illinois, serves residents of Warren and Newport Townships. They're proud of being “A Library for the 21st Century” and support that assertion by offering their patrons the best technology for their needs. Kevin Getty is the head of technology there. Along with one assistant, he provides support for sixteen servers with 120 devices attached, thirty-five of which are public work stations. They were getting bogged down by patrons in the library downloading larger and larger files, plus patrons on the outside of the library accessing catalogs and other services. Getty started searching for a software solution. His ideal was a one-step solution. He found NetEqualizer and once he had it in his hands, it was up and running within twenty minutes. Immediately we saw a difference. Getty admits it took a day to get used to what the NetEqualizer was doing. The patrons were no longer getting first-served service, but they were getting best-served service. Heavy users were being slowed down so all users could flow optimally. NetEqualizer also gave him more control and understanding of the usage of his network, so he could see heavy users and identify problems he never could before, and all without having to actively manage it to get the results. In a second I can look at the logs to see if there's a problem. The NetEqualizer helps us troubleshoot problems on the network. It's been really great. Solutions like NetEqualizer help me to do my job better. The two (2) NetEqualizers that we purchased last year have really helped us keep all of our locations running smoothly. We’ve been able to prioritize staff operations and VoIP phones, then allocate remaining bandwidth to public and wireless systems efficiently. Our network has been more stable, even though we now have 2 other library systems pulling from a shared circulation and catalog system housed at our location. We've been using your NetEqualizer 350Mbps unit since Spring 2009. I had been looking for a dynamic equal-bandwidth policy based unit for quite some time, and had been unsuccessful. The NetEqualizer was a fraction of the cost of other solutions, took me all of five minutes to configure, and works wonderfully. I have had many students come to my office for the express purpose of thanking me for buying more bandwidth, which I didn't - I just replaced our Packeteer with a NetEqualizer. One of their engineers convinced me that I didn't need to put in any exceptions or special policies for specific areas of campus or servers, and he was right - the almost-default configuration works great. On top of all of this, at the core it's just a 1U debian box with a flash drive. There's nothing I like better than standards-based, open-source-based networking solutions that I already know how to work with. Good job guys! Background: Washington County Cooperative Library Services (WCCLS) provides services to fifteen (15) member libraries across 20 sites within Washington County, Oregon. WCCLS' member libraries support over 295,000 patrons, circulating 13 million physical and digital assets. Sylvia Lee is the Library Automation Systems Supervisor at WCCLS, and Josh Chilcott is a Network Analyst II on her team. Washington County Cooperative Library Services is focused on building out infrastructure to support the 21st century library, including 24x7 online access for library patrons. In mid-2012, they upgraded their Integrated Library System, and added mobile access to their full catalog. Washington County Cooperative Library Services (WCCLS) provides services to fifteen (15) member libraries across 20 sites within Washington County, Oregon. WCCLS' member libraries support over 295,000 patrons, circulating 13 million physical and digital assets. WCCLS installed their NetEqualizer in November 2010, and have since upgraded twice, first to a 100Mbps license and then to a 150Mbps license. The Results: The NetEqualizer has lived up to its promises. Since the initial install, Josh has spent very little time supporting the NetEqualizer. He finds it is truly a "set and forget" type of device - It just works, alleviating congestion during busy times. From Sylvia's perspective, library budget is always limited, and a challenge is to maximize every dollar spent. To-date, the NetEqualizer has been a great investment, and has scaled as WCCLS bandwidth has grown. Learn more about how NetEqualizer can help your library with our unique, affordable traffic shaping technology. 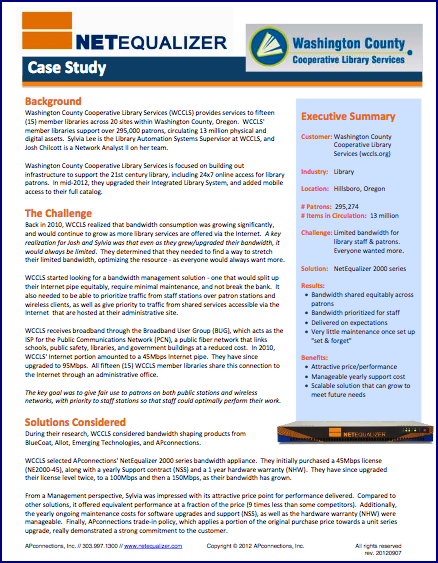 Read our Library Case Study to learn more about Washington County Cooperative Library Services (WCCLS) experience with the NetEqualizer.